When Stephanie Hunter and her wife sold all of their furnishings and moved to Hamilton two years ago, they were surprised and thrilled to find free furniture all over the place – by the curb, in parking lots, at thrift stores, on Kijiji. This was not the case in Vancouver, where they’re from. "We discovered we could furnish our new home for a pittance – but that it might not look not so pretty," says Stephanie, "So I set out to beautify our new-old stuff." She started at the library, with how-to books from the 70s. But upon opening the first bottle of furniture stripper, almost keeled over on the spot. A combined live-work space made it unsuitable for use of potent products. 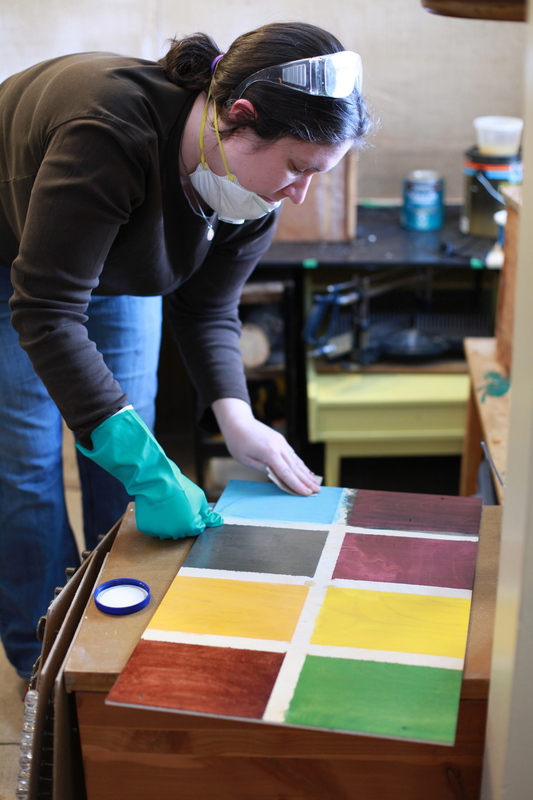 "I returned to my first love – research – and discovered loads of eco-friendly products on the market," Stephanie explains, "From biodegradable stripping compounds and non-toxic mineral spirit alternatives to water-based and zero-VOC paints and stains." Inspired by this, she started Rekindle Home. Stephanie's upcycling business allows you to refurbish home furnishings with custom refinishing and upholstery suited to your taste. We appreciate that she uses environmentally-conscious products and processes. We visited Stephanie at her workspace to take in the creative process. Each piece is refinished by hand so the result is a truly unique, artisan finish. 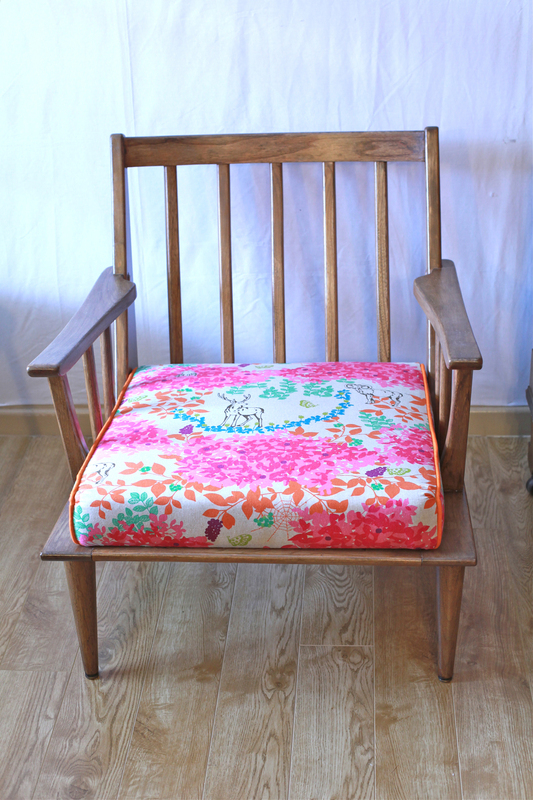 What are the benefits of upcycling and including upcycled furniture in one's home? The most obvious benefit is waste reduction. Instead of throwing out the old and bringing in the new, we re-use what’s already on hand and save tons of waste from piling up in landfills. Landfills emit greenhouse gases, so it costs the environment too. Waste is expensive on so many levels! Perhaps less obvious is the benefit of tradition. You know all that beautiful furniture handed down by your great aunt? It might not look so snazzy in your contemporary space, but it’s built better than anything new…so why not refinish it to match your modern design aesthetic? By upcycling what you already own and love with a new custom finish, you get to keep your memories close. Repurposing is great too – maybe you’ve inherited a coffee table you have no need for? We can turn it into a bench. Or a pet lounger! What types of pieces do you gravitate towards working with? We find our stuff all over the place – curbside, online, thrift stores, flea markets, estate sales…you name it. We’re also lucky to have great friends and clients who text us with furniture sightings, and let us know if they have pieces to unload themselves. I like anything with good bones, clean lines and a contemporary, industrial or elegant feel. My favourite styles at the moment include mid-century modern and anything French. Which part of the process, from start to finish in producing a piece, do you enjoy the most? Stripping off an old finish is pretty great, especially when you don’t know what’s underneath. It’s neat to see the layers come off and imagine the piece over the course of its life – sometimes it’s easy to date the layer depending on the colour and type of paint. It’s “If These Walls Could Talk”, only with furniture! Comparing before and after shots is pretty great too. Staging a finished piece for final photography is very satisfying indeed. What is unique about your line of upcycled furniture? First, we use refinishing products that are biodegradable, non-toxic, non-caustic, water-based, low- or zero-VOC. We also tend to use unusual combinations of products in colouring our pieces – vegetable dyes, fabric dyes, wood dye concentrates, pigment powders in linseed suspension – and I tend to mix my own custom colours. Depending on the piece, I might stain it using tea or coffee…and as soon as I have a minute, I’m going to experiment with turmeric and chili powder. Yum! 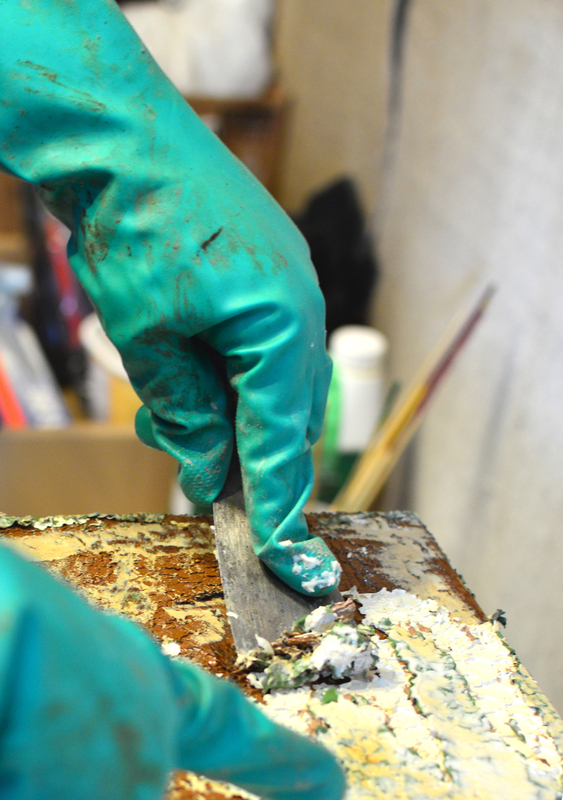 I like to get into the science of finishes, because science is cool. Is there any piece you have created that holds a special place in your heart? I have a real soft spot for the first piece I ever refinished: a swing era dresser done in a deep raspberry candy-gloss. This was my first foray into mixing oil- and water-based finishes, which turned out to be really cool looking and super durable. Do you ever discover interesting history or stories behind a piece you are working on? It’s wonderful to imagine how our pieces lived before we got a hold of them, and sometimes we have the privilege of learning their stories. We’re currently working on a beautiful dresser we bought from a lovely local man. He got it from his mother, who got it from her mother, who bought it at Marks & Spencer in 1928. As we were moving it, he discovered a piece of his grandma’s old costume jewelry caught inside the casing – which gave him a lovely reason to call his mom! It’s good to know we were both able to help each other out, and that our questions about the piece sparked happy memories for him. Stephanie testing out various stains, pigments and distressing techniques. Each piece is chemically stripped by hand. After the distressing is finished, it is sealed in with varnish. Dry and cure times can range from 3 hours to 3 weeks. Stephanie sources fabrics from local or vintage shops in and around the Greater Toronto and Hamilton Area. Stephanie's upcycled pieces are available on her Etsy site and in local shops like Flik by Design in Toronto. If you have a cherished piece you would like to update to fit your home decor, Rekindle Home offers custom refinishing and upholstery, as well as colour-matching and design advice. Contact Stephanie here with questions about custom orders!